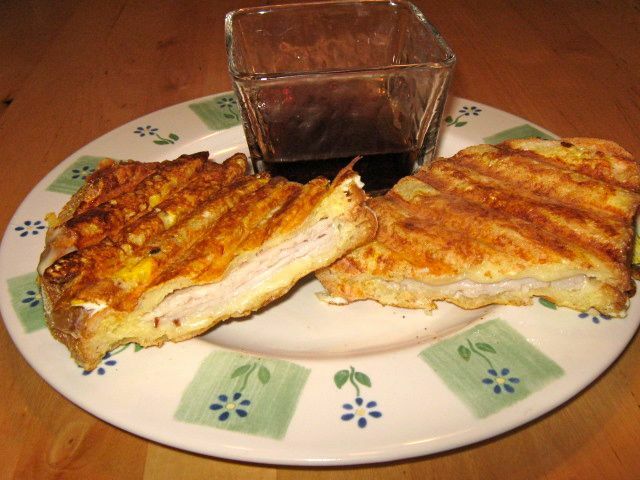 The Monte Cristo is another great sandwich recipe that you can easily convert into a panini. I used to love ordering a Monte Cristo as a late night snack at my local diner. The combination of the sweet French Toast style bread and saltiness of the Ham and Swiss Cheese is great at any time of the day. In a bowl, add the egg, milk, vanilla & cinnamon. Whisk until well mixed. Arrange the Swiss Cheese and Ham on a the two slices of bread to create a sandwich. Dunk the entire sandwich into the egg mixture to coat the bread slices. Place onto a preheated panini grill and close the lid. Cook for 3 to 5 minutes. Sprinkle with powdered sugar and serve with a bowl of maple syrup for dunking or a serving of fruit jelly. The Count of Monte Cristo is a classic book that was written by Alexandre Dumas and he had absolutely nothing to do with the Monte Cristo Sandwich. But if I was locked up in prison for years, the first thing I’d do when I got out would be to fire up the panini grill and make a Monte Cristo Panini. As usual, there are lots of options when making a Monte Cristo. Starting with the choice of bread. Since the bread will basically become French Toast you might way to try a nice egg bread like you’d get on Easter. Or to make it heartier, go with a sour dough loaf and slice it thick. Now it’s time for the sandwich part. Ham and Swiss Cheese are the usual ingredients but it can also be made with Turkey. Sometimes I have leftover gruyere from when I go on a fondue bender and so I’ll use that for Monte Cristo Panini the next day. Gruyere is even better than regular Swiss. And since the cost of vanilla extract has gone through the roof you use vanilla almond milk instead of the milk and vanilla. I think it tastes even better this way. Here’s the tricky part about making this sandwich in a panini press. You can follow the instructions above to coat the entire sandwich with the egg mixture or you can coat one slice of bread and place it on the hot panini grill. Then quickly add the ham and cheese and then coat the top piece of bread and place it on top. Cook it until it looks nice and crispy. You can follow this Monte Cristo Recipe or come up with your own variation. Either way, it’ll be great.